Sometimes, something so small and insignificant from the past can turn up frightening the hell out of you. A single Nazi postage stamp – hidden for decades – surfaces in Paris, threatening to expose a shameful secret of World War Two that could change the history books. On a holiday in Europe, New York ad man Ted Oakley and his partner Jennifer Swanner become innocently entangled in a web of international intrigue when they unknowingly buy a vintage object concealing the stamp. Their lives change when Ted, curious in what he has found, and not knowing anything about stamp collecting, takes the stamp to a philatelic dealer in Zurich, who at first dismisses it, not realizing his mistake until Ted had left his shop. In an attempt to find Ted, the dealer foolishly tells others of his discovery. The work of a Czechoslovakian master engraver in 1940, this solitary stamp suddenly becomes sought after by the unscrupulous Zurich stamp dealer, a Japanese millionaire collector, the Queen’s Deputy Private Secretary, and MI5. Each have their own veiled reasons to obtain it from the unsuspecting couple. In Paris, Zurich, London and Tokyo, their frantic search for the stamp will result in three people being murdered, causing the destiny of this tiny paper rectangle to take a sudden unexpected turn. 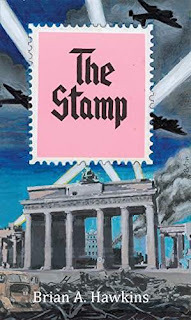 The Stamp seamlessly intertwines fascinating philatelic facts throughout the story, uncovering little-known Second World War historical events, wartime forgeries and key Nazi characters that makes the creation of this potentially explosive philatelic time bomb convincingly plausible. It ventures into the rarified world of rare and high-value stamp collecting, the Royal Philatelic Collection, London’s Gentlemen’s Clubs, Postmaster Benjamin Franklin, a strange Swiss sapphic nightclub and Germany’s surreal Karl May Society. The Stamp is a swift-moving story that keeps you in suspense until the very last page.